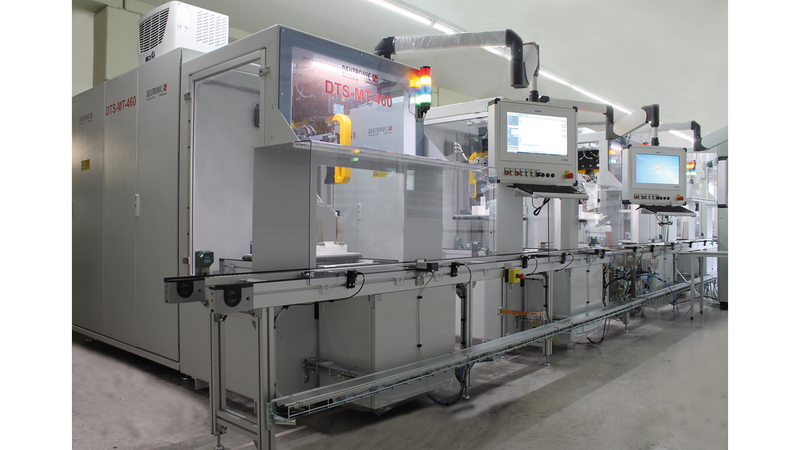 Modern test concepts for various electro mobility components do not only require a deep understanding of the drive technology but also a high degree of automation to optimize the cycle time in a series production. Because of the high specimen performance, the mechanical setup requires a suitable construction. The focus of this EOL test station is on the fully automated test sequence which also includes the mechanical and electrical contacting. Flexible production uses are possible because of the fast and uncomplicated change of the contacting unit. The test sequence is defined and loaded by the recorded barcode on the work piece carrier. The collection and permanent storage of test data ensures the unrestricted reproducibility of measured values, even across systems.